Overlooking Lalu Island and Sun Moon Lake, the pagoda is 46 meters tall and surrounded by beautiful foliage, trees, stone tables and chairs. Visitors love relaxing in this area while enjoying the magnificent scenery. A 700-meter long path leads to the pagoda, flanked by trees and colorful flowers. Tourists enjoy a leisurely walk along this path. The octagonal pagoda has 12 stories: the three lowest ones are colored while the nine upper floors, which make up the main body, are golden red. President Chiang himself oversaw and finalized the design. 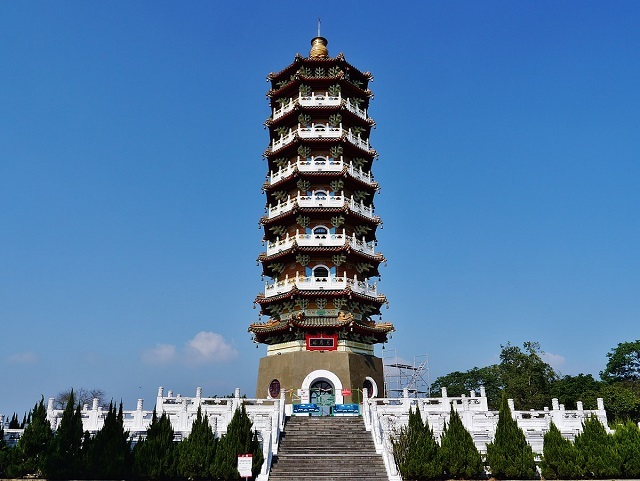 The pagoda has a 700-meter-high staircase that visitors love to climb in order to get a better view of the surrounding areas. It was not easy constructing this tower. Following traditional the Chinese style of architecture, workers had to ship building materials from far away, across the lake and up on the 954-meter-high mountain. Today, the beautiful, looming pagoda makes all the hard work worth it. As though the enigmatic Sun Moon Lake were not beautiful in itself, the Ci-en Pagoda is not hurting the surrounding scenery either. The city of Nantou in Central Taiwan may not be the most popular city in the country but it is home to amazing natural spots that deserve international attention, such as Sun Moon Lake. Nantou is literally the heart of Taiwan since it is located dead center geographically. Nantou City is located in Nantou County, the only county in Taiwan that does not have a coastline. The county is 4,100 square kilometers. It is home to Zhoushui River (Taiwan’s longest river), Yushan Mountain or Mount Jade (Taiwan’s highest peak) and of course, Sun Moon Lake (Taiwan’s most beautiful lake), accentuated by President Chiang’s pagoda. Beside the pagoda is a much smaller building, which was used as a rest house by the late president. The Pagoda was one of President Chiang’s most favorite places to visit and relax. He enjoyed not only looking at the lake and the mountains, but also watching fireflies as darkness fell; something that tourists today could also get to enjoy. The best months to visit are from May to April when the Black-winged Fireflies show themselves, as well as in October and November when the Mountain Fireflies make their appearance. To get to Ci-en Pagoda and Sun Moon Lake, simply take National Highway No, 1, to Jhong Cing Interchange and Jhong Cing Highway, which leads to Provincial Road No. 14. Continue on Provincial Road No. 21 to Yuchih and finally to the pagoda. If coming from National Highway No. 3, go to Ming Jian Interchange, then to Provincial Road No. 16 all the way to Shuei Li. Then take Provincial Road No. 21 to Yuchih and finally to Ci-En Pagoda.